If you're new to aquariums or just looking to add a pretty, peaceful fish to your community tank, you can't go wrong with the Pearl Danio. This easy-going species is hardy, easy to care for, and gets along with just about any other peaceful fish. Its iridescent colors make it unusually attractive, and provide a background to flashier species. Even better, the Pear Danio thrives in a smaller 20-gallon tank and reproduces readily in captivity. Initially imported in Europe in 1911, this species has been a popular fish in the aquarium industry ever since. They originate from clear swiftly moving streams and rivers in Myanmar (formerly known as Burma), Thailand, and Sumatra. In nature, they feed primarily on insects. This species has several synonyms, several of which were initially assigned to what were later determined to be color variants of the same species of fish. Debate still exists over the classification of these differences in coloration. At one time this species was classified under the Brachydanio genus, which has since been declared invalid. However, many books and articles still utilize the Brachydanio name. 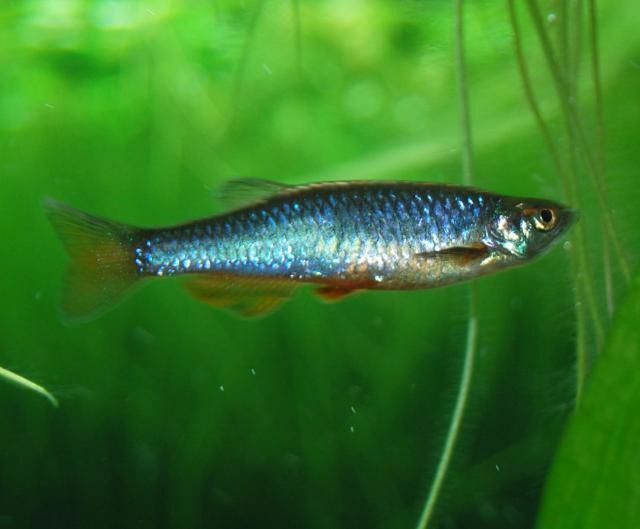 If you've seen a Pearl Danio you know the iridescent colors it's named for make it one of the most attractive freshwater fish. Its pearly blue-violet hued body is accented by an orange-red stripe running from tail to mid-body. Males are smaller, slimmer, and more colorful, often showing a red tint along the ventral aspect. A yellow ochre color variant, known as the 'Yellow Danio', is available in some locations. Pearl Danios have a forked tail, paired barbels, and reach a maximum length of two inches (6 cm). They live for approximately five years. An extremely hardy and easy to care for fish, Pearls make an excellent beginner fish. They are peaceful and well suited to community tanks with other small to medium sized fish. Like others of the Danio family , Pearls live in schools and should always be kept in groups of four or more. Pearl Danios are well suited for community aquariums and get along with any peaceful fish. They are tolerant of a wide range of water conditions, which also make them suited to combining with a variety of other fish. As a schooling fish, they should be kept in groups of at least four, preferably more. Males will show their best colors if there is at least one female present. Originating from fast-moving streams and rivers of Burma, Thailand, and Sumatra, the Pearl Danio is accustomed to a strong water current and ample swimming room. Because they require a slightly higher oxygen level than other Danios, good filtration is important. Pearls tolerate cooler temperatures well and may be kept in an unheated tank. They swim at all levels, but due to their propensity for jumping, the tank should be well covered. Longer tanks are preferable, with plants along the back and sides. Their iridescent colors are most visible under reflected, overhead lighting. They are particularly fond of early morning sunlight. Although undemanding about water parameters, they do best in neutral water that is soft to slightly hard. Pearl Danios are an easy to breed egg laying fish. The female is fuller-bodied, while males are noticeably smaller and more colorful. Like other Danios, when breeding pairs form they are very loyal. The breeding tank should be warm, 79-86F(26-30C), and the water level shallow, about four to six inches (10-15 cm). Fine-leaved plants should be provided, either floating or planted in a group. Marbles make an excellent substrate that will allow stray eggs to fall out of the reach of hungry adult fish. Pearl Danios will spawn as pairs or in a school. Half as many females as males should be placed in the breeding tank several days before introducing the males. Once the males are added, pairs will form and leave the group to scatter eggs among the plants. Remove the adults as soon as spawning is completed, otherwise, they consume their own eggs. Keep the tank dark while the eggs develop, to prevent fungal growth. The fry will emerge in 36 to 48 hours and should be fed freshly hatched brine shrimp or infusoria. Young grow rapidly and will be free-swimming in six to seven days. They may be raised on finely ground dry food or commercially prepared fry food. Otherwise, check out all of our other freshwater fish breed profiles. Can You Have Piranhas in Your Fish Tank?